In one of the devotions in the Grandmother's Bible from Zondervan, Jan Silvious focused on Psalm 139:1-12. She said, "It's true it's all about God, but in the long run, He is all about you. He created you, gave breath to your lungs and sustains your life . . . His love for you is without bounds. His interest in you is intense. . . He created you with purpose and ability . . . He is God. He created you and He absolutely adores His creation. Pass this good news on to your grandchildren. They know you love them, but the greater news is God, Who created them, loves them without limit." Today my sweet grandchildren are at my house to celebrate their poppa's birthday. 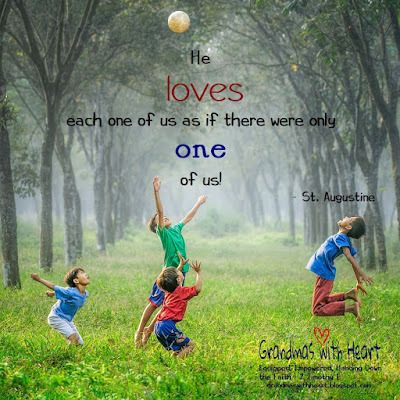 For almost ten years we have experienced the incredible joy which comes with being grandparents! I'm so tremendously thankful for the three boys with whom God has blessed us and for the truth God is all about them! God created them, gave them breath in their lungs and sustains their lives. God's love for our grandsons is without bounds! His interest in them is intense! He created these boys with purpose and ability . . . great amounts of ability! God created them and He absolutely adores His creation! I will pass this incredible truth on to these boys. They know I love them and they know God loves them. I want them to know God's love for them is without limit! I'm so tremendously thankful for my sweet grandsons - they make my heart happy! They are some of God's most incredible gifts I've ever received! Grandchildren are definitely a gift from God. I have six, 5 girls and 1 spoiled boy! Love them all.